IARU Participation in ITU-Radiocommunication Consultations "Mutually Beneficial"
In a Public Notice released on December 1, the FCC's Office of Engineering and Technology (OET) has invited comments by January 31, 2018, on a wide-ranging series of Technological Advisory Council (TAC) recommendations that, if implemented, could alter the spectrum policy regulatory landscape -- especially with respect to interference resolution and enforcement. An advisory body, the TAC's membership includes several Amateur Radio licensees. ARRL will file comments in the proceeding, ET Docket 17-340. Consider adopting the spectrum management principles spelled out in the Council's Basic Spectrum Principles white papers of March 2014 and December 2015, and "set clear expectations about the affected system's capabilities regarding interference, such as harm claim thresholds." More broadly adopt risk-informed interference assessment and statistical service rules. "In judging whether to allow new radio service rules, the TAC observes that the Commission has to balance the interests of incumbents, new entrants, and the public," the Public Notice explained. "The process of analyzing the tradeoffs between the benefits of a new service and the risks to incumbents has, to date, been essentially qualitative." Implement "a next-generation architecture" to resolve interference and establish a public database of past radio-related enforcement activities. The TAC also recommended that the FCC "incorporate interference hunters in the [interference] resolution process." The TAC spelled out a set of three "Interference Realities," which, in part, assert that harmful interference "is affected by the characteristics of both a transmitting service and a nearby receiving service in frequency, space, or time," and that radio services "should expect occasional service degradation or interruption." The TAC also posed three "Responsibilities of [Radio] Services" that, in part, state that "receivers are responsible for mitigating interference outside their assigned channels" and that "transmitters are responsible for minimizing the amount of their transmitted energy that appears outside their assigned frequencies and licensed areas." The TAC acknowledged that the FCC, by and large, does not regulate receiving systems. In another three principles under "Regulatory Requirements and Actions," the TAC suggested that the FCC may "apply interference limits to quantify rights of protection from harmful interference." According to the Public Notice, the TAC "has recommended interference limits as a method for the Commission to communicate the limits of protection to which systems are entitled, without mandating receiver performance specifications." 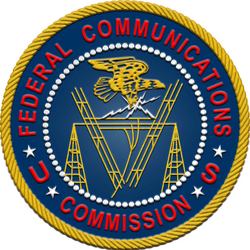 The TAC called for a "quantitative analysis of interactions between services" before the FCC could "make decisions regarding levels of protection," the OET said. "[T]he TAC believes the principles can be applied to all systems and result in an optimal solution for each service," the Public Notice said. The TAC has suggested that the FCC not base its rules on exceptional events and worst-case scenarios, but on reality. "The TAC recommends that the Commission start soon, and start small, and not attempt a major overhaul of its regulatory approach," the Public Notice said. ARRL has announced that W1AW will start scheduled transmissions on 6 meters beginning on January 2. 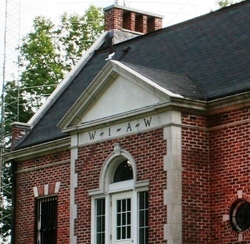 W1AW will add 6 meters -- specifically 50.350 MHz -- to its regular CW code practice, and CW, digital, and phone bulletin transmission schedule, starting with the 1400 UTC fast code practice on January 2. In addition to providing regularly scheduled transmissions on 6 meters, another goal of the W1AW transmission on the "magic band" is to act as a beacon on 6 meters, especially from the northeast US. Signal reports will be welcome. A web page will allow listeners to submit signal reports. Listeners may also e-mail their reports to W1AW. 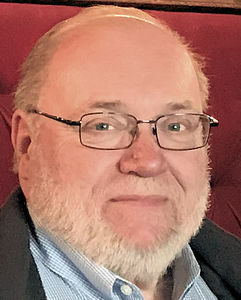 Jim Kvochick, K8JK, of Brighton, Michigan, has been appointed as Michigan Section Manager for the first half of next year. His appointment will begin on January 1, 2018, and will continue through June 30. Kvochick was appointed by ARRL Radiosport Manager Norm Fusaro, W3IZ, in consultation with ARRL Great Lakes Division Director Dale Williams, WA8EFK, and outgoing Michigan Section Manager Larry Camp, WB8R. Camp, who has served as SM since 2012, intends to step down from the volunteer position on December 31, when his term of office concludes. An ARRL Life Member, Kvochick was licensed in 1968. He has been active in many facets of Amateur Radio, including public service, experimenting, and equipment restoration. He currently serves as an Assistant Emergency Coordinator and a Volunteer Examiner. He is president, newsletter editor, and technical director for the Livingston Amateur Radio Klub. Kvochick's appointment will bridge the gap until a Section Manager is elected in Michigan. According to the Rules and Regulations of the Field Organization, when a Section Manager vacancy occurs between elections, the position is filled by appointment. The Michigan appointment was necessary because no candidate was nominated to succeed Camp by the time the deadline for Section Manager nominations arrived in September. The same situation exists in the ARRL East Bay, New Mexico, and Santa Barbara sections. Nominations are being resolicited in all four sections for candidates to serve an 18-month term of office starting on July 1, 2018; the resolicitation will appear in the January and February 2018 issues of QST. Section Manager nomination forms and related information are available on the ARRL website. "Listener Mailbag" is the topic of the new (December 7) episode of the "ARRL The Doctor is In" podcast. Listen...and learn! "Amateur Radio has filled a vital need for communications, since the storm destroyed most of the island's wired and wireless infrastructure," Dorr noted. "Many of our fellow Amateur Radio operators and contesters are among the people who suffered significant damage." The WWROF said the contesting community in Puerto Rico has expressed a continued need for generators to stay on the air and to power their homes for ongoing communication needs. Currently, electric power has been restored to roughly two-thirds of the island, but full power may not be back until early next year, according to some estimates. Generators remain in high demand and in very short supply on the island. The Amateur Radio and Radiosport communities may donate to the KP4 Generator Project via PayPal (to donations@WWROF.org), via credit card on the WWROF website (click on the DONATE button), or by check to WWROF, P.O. Box 529, Fredericksburg, TX 78624-0529. The mission of the Worldwide Radio Operators Foundation is to improve the skills of Amateur Radio operators around the world, utilizing education, competition, advancement of technology, and scientific research. The foundation focuses on promoting international friendship and goodwill, and on preparing operators to better serve society in times when communication support is needed. 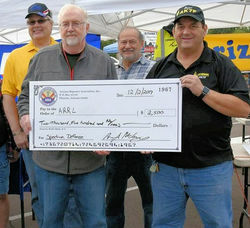 At the December 2 Superstition Hamfest in Mesa, Arizona, the Arizona Repeater Association (ARA) presented its annual donation of $2,500 to the ARRL Spectrum Defense Fund. This marks the fourth consecutive year that the club has contributed. ARRL Southwestern Division Vice Director Ned Stearns, AA7A (left), accepts an ARRL Spectrum Defense Fund donation from the ARA's Brian McCarthy, AK7F. "ARRL is deeply appreciative to all the members of the Arizona Repeater Association for their ongoing support to the ARRL Spectrum Defense Fund," said ARRL Development Manager Lauren Clarke, KB1YDD. "With ARA's most recent gift of $2,500 to this important fund, ARRL is pleased to welcome the Arizona Repeater Association into the Maxim Society!" That honor is reserved for individuals and organizations contributing at least $10,000. The ARA contingent, headed by Brian McCarthy, AK7F, presented a symbolic check to ARRL Southwestern Division Vice Director Ned Stearns, AA7A; ARRL Arizona Section Manager Rick Paquette, W7RAP, and other Arizona Field Organization staffers. At the same hamfest, a plaque signed by Arizona Governor Doug Ducey declaring October 28 -- the date of the ARRL Arizona State Convention in Maricopa -- as Amateur Radio Day in Arizona was presented and displayed at the ARRL booth. 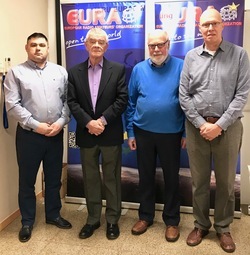 International Amateur Radio Union Region 1 (IARU-R1) President Don Beattie, G3BJ, and European Radio Amateurs' Organization (EURAO) President Petrica Stolnicu, YO9RIJ, met on December 2. The meeting was held against a background that both IARU Region 1 (Europe, Africa, the Middle East, and northern Asia) and EURAO have letters of understanding with European regulator CEPT, enabling their participation in the work of CEPT. Also present were IARU Region 1 Spectrum and Regulatory Liaison Committee chair Dave Court, EI3IO, and the Secretary-General of the EURAO Regulatory Liaison Committee, Joan-Carles Samaranch, EA3CIW. (L-R) EURAO President Petrica Stolnicu, YO9RIJ; IARU Region 1 President Don Beattie, G3BJ; IARU Region 1 Spectrum and Regulatory Liaison Committee chair Dave Court, EI3IO, and EURAO Regulatory Liaison Committee, Joan-Carles Samaranch, EA3CIW. According to a joint IARU Region 1/EURAO news release, the meeting was held "to explore areas of common interest, recognizing in particular the desire of CEPT for representative organizations to present a common Amateur Radio Service position." The joint news release said the two organizations "exchanged views on their priorities for the Amateur Radio Service, after which a more detailed discussion took place on the ways in which they might cooperate in the interest of the future of Amateur Radio." "Both organizations accepted that they had shared objectives, identified some specific areas for interworking, and will continue a constructive dialogue into the future," the organizations said. 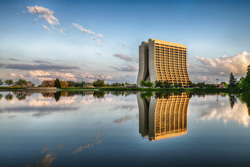 Over the past year, tensions between IARU R1 and EURAO spilled over into the public arena regarding arrangements for the two organizations to meet. After a brief discussion last June at the Friedrichshafen, Germany, Ham Radio event, EURAO and IARU R1 agreed to the December meeting. 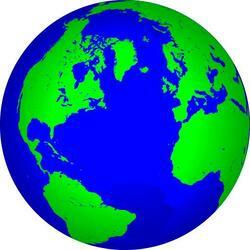 With a motto of "A global open Amateur Radio community," EURAO was established in 2005 as a clearing house for independent Amateur Radio organizations, primarily in Europe. It is headquartered in France. EURAO has stated its interest in lobbying public administrations, while the IARU has said that part of its focus is to "interact with the agencies responsible for regulating and allocating radio frequencies." The IARU is a federation of national Amateur Radio associations representing more than 150 countries and separate territories around the world, about 90 of them in IARU Region 1. Several countries around the globe have allowed access to new and expanded frequency allocations. Croatian radio amateurs now have a secondary 60-meter allocation of 5351.5-5366.5 kHz, as agreed to at World Radiocommunication Conference 2015 (WRC 15), with a maximum 15 W EIRP. For the last several years, the Croatian Regulatory Authority for Network Industries (HAKOM) had issued 1-year licenses to operate on 60 meters. Hams in Croatia now also have access to more of 160 meters: 1810-1850 kHz with a maximum power of 1.5 kW PEP, and 1850-2000 kHz with a maximum power of 1 kW PEP. The changes became effective on December 2. Earlier this fall, radio amateurs in Colombia gained new allocations at 60, 630, and 2200 meters, as a result of efforts by the Liga Colombiana de Radioaficionados (LCRA) -- with the support of its "strategic partner" Liga Radio Bogotá (LRB). Access to the new bands was to become effective when the Colombian Communications Ministry granted the privileges by administrative act. The new allocations are 135.7-137.8 kHz (2200 meters); 472-479 kHz (630 meters); and 5351.5-5366.5 kHz (60 meters). In Germany, radio amateurs now have a 60-meter band plus an extended 6-meter band, the Deutscher Amateur Radio Club (DARC) reports. Amateur Radio has been allocated the band 5351.5-5366.5 kHz at a maximum power of 15 W EIRP on a secondary basis. This is in accordance with the allocation agreed upon at WRC 15. In addition, 6 meters was expanded slightly. The band 50.08-51.0 MHz, previously allocated to Amateur Radio on a secondary basis, has been enlarged to 50.03-51.0 MHz at a maximum 25 W EIRP. Spain has also adopted the global, secondary 60-meter Amateur Radio allocation of 5351.5-5366.5 kHz, per WRC 15.
International Amateur Radio Union (IARU) President Tim Ellam, VE6SH/G4HUA, has praised the value of the IARU's participation over the years in International Telecommunication Union (ITU) International Radio Consultative Committee (CCIR) and ITU Radiocommunication Sector (ITU-R) study groups. CCIR was the forerunner to ITU-R. In an article, "The International Amateur Radio Union and CCIR/ITU-R" in the latest issue of ITU News Magazine (see page 55), Ellam said the IARU has been a "regular contributor" to the CCIR and ITU-R study groups and working parties on behalf of the world's Amateur Radio community. This year marks the 90th anniversary of CCIR/ITU-R study groups; the IARU was first admitted to the work of CCIR in 1932. "The relationship is mutually beneficial," Ellam wrote. "The Amateur and Amateur Satellite services offer...private citizens...the opportunity to intercommunicate and experiment with radio transmission to increase their personal knowledge and skills. Radio amateurs [provide] communications at no cost with their own equipment in the event of natural disasters. They share what they learn with one another and with the wider telecommunications community, in part through ITU-R Recommendations and Reports." ITU-R Study Group 5 and Working Party 5A (WP-5A) are home to both the Amateur and the Amateur-Satellite services. ITU-R Study Groups met in November in the run-up to World Radiocommunication Conference 2019 (WRC-19). Working Group 5A1, chaired by Dale Hughes, VK1DSH, is responsible for WRC-19 Agenda Item 1.1, which is looking into a 50-54 MHz band allocation in Region 1, harmonized with the allocations in Regions 2 and 3. ITU-R Recommendation M.1732, "Characteristics of systems operating in the Amateur and Amateur Satellite services for use in sharing studies," was developed by and updated in WP-5A. "The IARU also participates, as appropriate, in other Working Parties of Study Group 5," Ellam explained. Ellam said an increasing number of short-mission, non-geostationary satellites are being proposed "for operation in the limited Amateur Satellite allocations," inconsistent with the objectives of the Amateur Satellite Service. He said the IARU appreciates efforts within ITU-R working parties "to identify more suitable spectrum for telemetry, tracking, and command of these satellites" at WRCâ19. Read more. 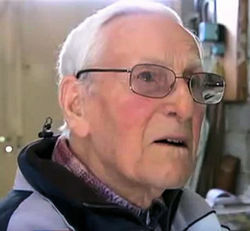 Jean Touzot, F8IL, of Albi, France -- said to have been the world's oldest radio amateur -- has died. The "dean of French radio amateurs," Touzot was 109 and enjoyed operating CW with an old-fashioned hand key and a modern Yaesu transceiver. He "retired from the airwaves for health reasons" at age 105 in 2014, according to media accounts. Until then, he had been active on the air, making daily contacts on 80-meter CW with other stations in France. In stepping back from his ham activity, Touzot said he was no longer able to send CW and made "too many mistakes." He was a member of France's International Amateur Radio Union member-society REF, as well as of the Union of French Telegraphists (UFT). 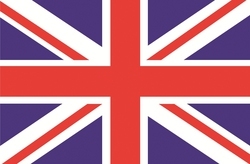 UK Regulator Allows Broadband Fixed Wireless Access into 5 GHz Amateur Band UK telecommunications regulator Ofcom has decided to allow Broadband Fixed Wireless Access (BFWA) in the 5 GHz Amateur Radio band. BFWA is widely used to deliver broadband Internet, particularly in difficult to reach areas. The decision removes a 20 MHz frequency "notch" in the band to accommodate road tolling systems. Ofcom said the notch is no longer necessary, since BFWA and the tolling systems can share spectrum. Earlier this year, the Radio Society of Great Britain (RSGB) commented in opposition to Ofcom's approach. The RSGB said it has no issue with removing the tolling systems notch but "does not agree with allowing BFWA use in the whole 5.8 GHz band." The RSGB also said that it "cannot find any basis for BFWA services to have regulatory rights or priority over the Amateur and Amateur Satellite allocations" in the band. December YOTA Month is Under Way: December is Youngsters on the Air Month (DYM) in IARU Region 1 (Europe and Africa), sponsored by Youngsters on the Air (YOTA). 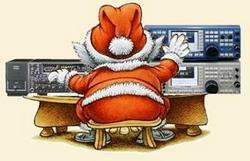 Each December, young radio amateurs and prospective hams get on the air from stations throughout the region bearing YOTA call sign suffixes. The idea is to demonstrate Amateur Radio to the younger generation and to encourage young people to become licensed and active on the air. More than 35 stations with a YOTA suffix are registered and on the bands. December YOTA Month is not a competition; it's all about having fun. Tad Cook, K7RA, Seattle, reports: Over the past 2 weeks, the average planetary A index increased from 6.7 to 11.6, while the average mid-latitude A index rose from 5 to 8.1. Predicted solar flux is 68 on December 7-10; 70 on December 11-14; 75 on December 15-16; 74 on December 17; 73 on December 18-20; 74 on December 21-22; 76, 74, 72, 73, and 72 on December 23-27; 70 on December 28-January 8; 72 on January 9; 75 on January 10-12; 74 on January 13; 73 on January 14-16, and 74, 74, 76, and 74 on January 17-20. Predicted planetary A index is 12 and 8 on December 7-8; 5 on December 9-10; 12 on December 11-12; 8 on December 13; 5 on December 14-16; 8, 25, and 10 on December 17-19; 8 on December 20-21; 5 on December 22-26; 10 and 8 on December 27-28; 5 on December 29-30; 32, 48, 18, 12, and 8 on December 31-January 4; 5 on January 5-6; 12, 15, 12, and 8 on January 7-10; 5 on January 11-12; 8, 25, and 10 on January 13-15; 8 on January 16-17, and 5 on January 18-20. 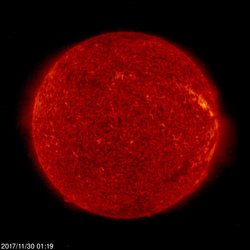 A new sunspot group (AR2690) emerged on December 6, after a period of no sunspots, but Spaceweather.com reports that, early on December 7, it was already fading. This weekend is the ARRL 10-Meter Contest. There is a good chance for sporadic-E propagation. Tamitha Skov released "A Mini-Storm Launch & a Fast Wind Chaser: Solar Storm Forecast 11-29-2017" last week.